Bolt shifted from paw to paw, muscles tensing, smile still fixed upon his features as the male thanked him and nodded. The young Alpha male listened with interest as the male began to spoke, ears perked forward to better catch his words. "Colossith is my name. I-I uhh have no clue...just give me whichever rank you think will suit me." Bolt nodded slowly, eyes clouding over with thought as he inspected the male, the gears turning in his head as he thought about the qualities the male had that would fit him into a certain rank. He was quite serious, and rather tough looking, which could make him a good warrior, yet something about him made the Alpha suspect he wouldn't fit well in there, or as a hunter, or as a healer, neither a scout. He had qualities that matched all that ranks. 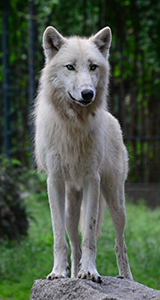 Bolt tilted his head, taking his gave off the male and directing them to the sky. There was another rank he thought the male was quite perfect for, and it might even show the male how much he could be respected in the pack, yet Bolt was unsure. He looked back at Colossith and nodded to himself, coming to a decision. He smiled again, the thoughtful looking fading away as he voiced his decision to the male. "How about the rank Beta male? You are extremely well fitted for it and I believe you would make a great one." 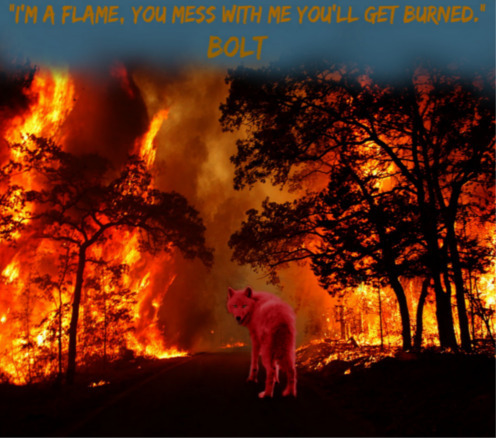 He asked calmly, tail flicking, waiting a few moment before the female started speaking, and Bolt turned his piercing yellow gaze, calm and interested, towards her, listening. "I'm Unknown - no joke. Literally my name is Unknown, an my best benefit would be keeping the area safe. I'm good at running and following scents, so that would be a scout." Bolt's expression turned amused after she finished speaking, nodding slightly. Scout, huh? A thought ran through his mind, similar to the other thoughts he had been he had accepted Sally and asked Colossith if he would like to be beta; why not ask if she wanted to be the Lead Scout? He always trusted the members, or rather in this case, soon to be members of his pack, because without trust everything could fall apart so easily, and he was surely showing it now. "Scout? 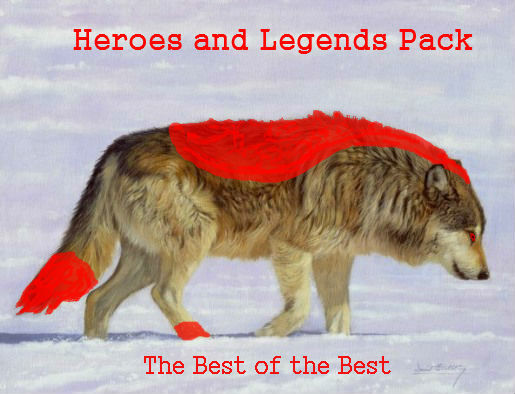 We don't have many of those in this pack. In fact, we don't even have a Lead Scout. Would you like to take up the rank? You seem rather experienced in the rank and something tells me you could very easily order a group of wolves." He asked curiously. He hoped he wasn't making a wrong choice, but really, you never knew until you tried. His ears shifted back towards where his mate and Sally where, managing to catch something about six puppies and genders yet not exactly what, which made him him slightly excited. Six puppies? He didn't know if he had heard right, but he hoped he did. Bolt's ears immediately pinned against his skull at the loud words and he lowered his head, though a smile remained on his features and his tail wagged in response. "Just a bit of it."" He responded, raising his head back up to eye level, but his ears remained pinned to his head. Sally smiled happily at the wolf's happy gaze. New pups in the pack would be great! She laughed at Kimbra's excited words when she ran over to Bolt. Watching them together, Sally suddenly felt a strange emotion well up inside her and couldn't help but wonder what it was like to have someone love you like that. She had only ever experienced the love of people which would never be the same. She had been too young to remember her mum when she was put up for adoption and watched Kimbra thinking with slight jealousy how her pups would get to grow up with a loving family. She would probably never get a mate here because she was a dog and this was a wolf pack, why would a wolf want to be her mate? Sighing sadly, Sally put on a fake smile and padded over to the rest. Hearing Bolt's last words, she nodded and spoke quietly. "Yep, there is going to be six pups. 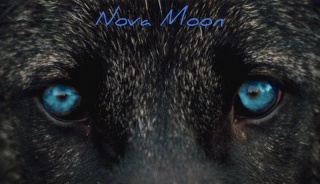 Four girls and two boys it seems"
She then sat back and turned her gaze away from the wolves. She would probably never fit in properly here because she was a dog who had grown up around humans. Notes: Awe poor sally, lol. 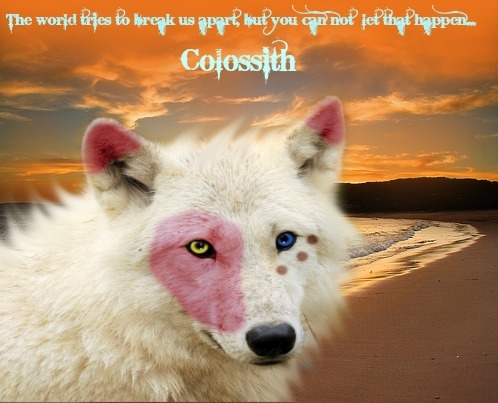 Unknown smiled when Colossith was offered beta male, she knew it was a good idea for him to join the pack. It would only bring good things for him, she waited for the alpha to address her. When he did her eyes remained on him with a calm demeanor, she glanced at him then at Colossith for a second. Her duo-toned eyes stayed locked with his for the moment while he looked at her; clearly listening. "Scout? We don't have many of those in this pack. In fact, we don't even have a Lead Scout. Would you like to take up the rank? You seem rather experienced in the rank and something tells me you could very easily order a group of wolves." "Yep, there is going to be six pups. Four girls and two boys it seems." 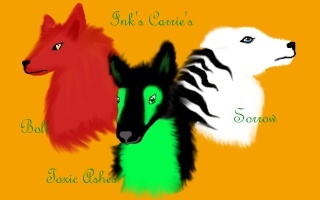 She heard two voices, one that was addressed to her and one that was addressed to the other alpha regarding their pups. She had never brought pups into the world but she figured it wasn't a bad thing but it wasn't a good thing. However the offer that the male offered her was a good offer, she was happy to agree with him. "I'd love to take the rank, I won't let you down." She said with a grin, she was happy to accept the offer. She glanced at Unknown, looking at him with the hopes he'd accept Bolt's offer. Notes: Sorry, I had no internet! "Just a bit of it." Bolt replied. Kimbra was still gleaming. "We're going to have pups!" she said, trying hard to maintain her excitement. She looked over her shoulder at where Sally was talking. "Yep, there is going to be six pups. Four girls and two boys it seems" Sally repeated. She gave a small smile and turned away. "Sally, where ever are you going?" Kimbra asked with a grin. Sally seemed like she was out of place. Was it because she was a dog and they were wolves? Was it because she doubted her place in the pack? Kimbra then realised she could just read what Sally was thinking. Even though Kimbra regrets using her power in front of others, it could be done. Kimbra went into Sally's mind and realised what she was thinking about. Why would a wolf want to be with a dog such as herself? Would she ever have a family? "Sally, that's not the case!" Kimbra said quickly backing it up. "Just because you're a dog doesn't mean you'll be alone..."
Text | "Speech" | Thoughts[/i] | "People`s speech"
"How about the rank Beta male? You are extremely well fitted for it and I believe you would make a great one." The red male said. Colossith was somehow wordless. Beta was considered an extremely high rank. Second in command. Never had he recieved this offer. "You think so?" Colossith replied uncertain of himself. [i] Why would this wolf offer him this rank? What had he done to deserve it? Nothing of course. Colossith glanced at Unknown who was offered lead scout. He smiled a little as she accepted, now it was his turn already. Colossith opened his maw about to replied, but the black female interupted him. He bit his lip hard looking at Unknown to the black female. Couldn`t she have waited till they were gone. Atfer all pack issues passes first, and this female could just have tell him later. The white wolf sighed. He felt like telling his way of thinking to the black female, how awful leader of the pack she is, but he didn`t. Colossith remained silent and glanced at Sally. She seemed to feel the same way as Colossith did before, but he didn`t pay much attention to the dog. "I dislike this female." Colossith said to Unknown pointing at the black female with blue eyes. He made sure to speak low enough so no one could hear except Unknown. Sally turned back as Kimbra asked where was she going, with a grin. Sally hesitated, not wanting to burden the alpha with her thoughts. She was about to say that she had just seen something but before she could, Kimbra talked. Sally's blue eyes widened in shock as the alpha told her that just because she was a dog that didn't mean she would be alone. Sally's eyes clouded, could it possibly be true? Yet she was too confused by how the wolf knew what she had been thinking to focus on it too much. Sally thought talking to other animals like she could was perfectly normal and didn't know that all the wolves in this pack had powers. "H-how did you know what I was thinking?!" She asked with wide eyes. Bolt listened as Unknown responded and he grinned, turning to look as Colossith, awaiting for a response. His ears perked forward, listening intently as the male spoke, seeming unsure. He responded with a reassuring smile, shifting his paws, ears twitching as he heard a strange cry. Like a yip that you would hear from a pup. He let his gaze scan his surroundings, confused, when he spotted a small creature, looking like a pup. It was being taken down the river, struggling against the water. Even though the water was slow flowing, it was still dangerous, especially to smaller creatures, the young being one of those creatures. Without a thought he ran, leaping into the water with a loud splash, water soaking into his pelt. Bolt swam towards the creature, strong limbs propelling him forward, closer. When he was finally able to, he gently took the yapping pup, as he had decided that is what he would call it, into his jaws and began turning to head back to shore. Once his feet met the ground he bolted out of the water, pelt dripping, feeling weighted by the water, placing the shivering pup onto the dry shore, near the other canines. His breath came in harsh gasps as he inspected the poor thing. It looked most definitely like a dog, though it looked strange. Different. It whimpered, looking up at him with wide eyes, obviously scared out of its mind. He asked, nosing it gently, yet he received no response. This was really a job for a healer. Notes: This post is real crappy, sorry for that, but it is late at night and my muse is low. All that equals bad post. Bolt's ears perked forward as a howl, familiar in sound yet strangely new in message, sounded through the air. It was from Kimbra about the pups. He remained still for a few moments before the coughs of the young pup before him caught his attention. He licked its fur to calm it before turning to Unknown and Colossith, thoughts whirling through his head. "I am sorry but for now I must depart. You are free to roam the territory. You can come find me at the dens if you have come to a decision about your rank." He said, grabbing the pup by the scruff, because he knew he couldn't leave the poor thing to shiver along the shore alone, open to attack. He made his way towards the dens, moving fast. "You'll always dislike someone in your lifetime." Unknown whispered back to Colossith, a small smile on her face. It wasn't like you could like everyone, so it was understandable why he wouldn't like one person. "But I am curious to know why you don't." Hopefully it was a valid reason, not just oh she's this and that. After all it was pretty clear that she was the alpha of the pack so, she just hoped it wouldn't cause problems. "Did you hear that?" She asked curiously, her head perked to where the howl came from. "I think we're being called, come on Colossith." She said while she padded off, on her way back to the Forest. Colossith nodded to the Alpha in respect. "Thank you, Alpha." He said smiling a little. Although Colossith wanted to ask one more question to the Alpha, he ran out of time as the red male made his way to the forest. Colossith glanced at Unknown feeling confused. "Why did he just ditched us?" He muttered out as he rolled his eyes feeling quite annoyed. "I dislike her because she doesn`t take care of her responsibilities." Colossith said trying to make sure Unknown would understood." An Alpha needs to take care of his or her pack before thinking about having pups." Colossith continued on. "I suppose we are." Colossith responded as he head back to the dark forest.